Nice concert review (in German) including photos & video! It was 22 years ago in 1995 when maligned British shoegaze pioneers Slowdive released their final album Pygmalion, disappearing into the sunset along with it. In 2014 they reformed, finally giving fans a chance to hear beloved late-period gems like ‘Crazy For You’ on stages throughout the world. But jamming old classics wasn’t all the band were up to – they’ve been hard at work in the studio crafting a fourth full-length, and from what we’ve heard it’s very, very good indeed. Let’s get sad. British dream-pop group Slowdive rocketed to the top of the Billboard + Twitter Trending 140 chart Thursday morning (Jan. 12) with "Star Roving," the band's first song released in 22 years. The song reached No. 1 on the chart at 8 a.m. ET Thursday, hours after it premiered on YouTube and other streaming services. While it’s wise to approach comeback albums with caution, the new Slowdive record feels like a fresh and vital addition to their discography, rather than a routine exercise in nostalgia. How would they characterise their artistic development? “Painful,” Halsted laughs. “[When] we were teenagers it was quite angsty music. I couldn’t even try to write the same way now. It’s the angst of a middle-aged man at this point.” “The depression of a middle-aged man, realising he’s no longer 21,” Goswell chips in mischievously. 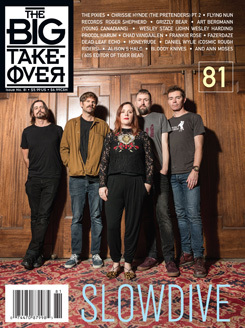 Over two decades since being ran out of town by an unforgiving music press, reformed 90’s shoegazers Slowdive are bigger than ever. As with the album, “Slomo” opens tonight’s show in majestic fashion, its shimmering guitar and woozy melody beginning an evening of blissed-out ecstasy, where lush layers of sound ebb and flow as guitarist Neil Halstead drenches Rachel Goswell’s honey-sweet vocal melodies in deep reverb. For every moment of meditative beauty (“Blue Skied an’ Clear”) there are others of heart leaping euphoria: the chorus to “When the Sun Hits” visibly takes the crowd aback. With its driving riff, new track “Star Roving” is Slowdive’s catchiest number: it might even be their best. They rework Syd Barret’s “Golden Hair” to close, reaching Sigur Ros levels of sonic crescendo to leave the Roundhouse in a state of reverie. Far from being a joke, Slowdive are enjoying the last laugh. Back from following Slowdive last week and what amazing shows. Glad you enjoyed it at Locomotiv!